RADCLIFFE, a small town, a parish, and a sub-district, in Bury district, Lancashire. The town stands on the river Irwell, near the influx of the Roach, and on the Manchester and Bury railway, adjacent to the Boltonand Bury canal, 2½ miles S S W of Bury; took its name from a red cliff on the opposite side of the Irwell; consists of two parts, called Radcliffe and Radcliffe-Bridge, about ½ a mile asunder; carries on bleaching, paper-making, cotton-spinning, calico-printing, gingham, fustian, nankeen, and check-weaving, machine-making, iron-founding, and small-ware manufacture; has several collieries; and has a post-office under Manchester, a railway station of Radcliffe-Bridge, with telegraph, a good inn, a police station, a market house built in 1851 at a cost of £1,500, a bridge over the Irwell, two churches, three dis-senting chapels, four national schools, an agricultural show on 28 Sept., races about the middle of Aug., a fair on 29 Sept., and charities £9. The parish church is ancient, of various dates; has a low massive tower; and includes a chapel restored in 1845, and a N transept added in 1846. St. Thomas' church, at Radcliffe-Bridge, was built in 1819, at a cost of £5,000; was rebuilt in 1865, at a cost of £7,274; is in the perpendicular English style; and contains 1,200 sittings. The parish contains also part of Starling village, and comprises 2,466 acres. Real property, £35,800; of which £8,940 are in mines, and £1,439 in gas-works. Pop. in 1851, 6,293; in 1861, 8,838. Houses, 1,726. The manor belongs to the Earl of Wilton. R. Tower, now a ruin, was formerly a great manorial mansion. The living is a rectory, and that of St. Thomas is a p. curacy, in the diocese of Manchester. Value of the former, £500; * of the latter, £300. * Patron of both, the Earl of Wilton. The sub-district excludes two small portions of the parish, but includes portions of three other parishes. Pop., 8,972. Houses, 1,754. Local studies information is held at Bury library. Details about the census records, and indexes for Radcliffe. You can also perform a more selective search for churches in the Radcliffe area or see them printed on a map. The Register Office covering the Radcliffe area is Bury. Ask for a calculation of the distance from Radcliffe to another place. "RADCLIFFE, a parish and township in the hundred of Salford, county Lancaster, 7 miles N.W. of Manchester, and 3 S.W. of Bury. It is a station on the East Lancashire section of the Lancashire and Yorkshire railway. The village is situated on the old Roman way, Watling Street, and near the Bolton and Bury canal. This parish, which includes the hamlet of Starling, is one of the smallest in the shire. It derives its old English name from a cliff of red rock on the S.E. side of the river Irwell, below its confluence with the Roach, and facing the village of Radcliffe. The village is built in two detached portions, designated Radcliffe and Radcliffe Bridge, about half a mile distant from each other. The parish is separated from the township of Pilkington by the river Irwell, which is here crossed by a bridge of two arches. A large portion of the inhabitants are employed in the cotton mills; and several coal mines are worked in the neighbourhood. The principal part of the land is in meadow and pasture, with some orchard and woodland. A market house was erected in 1851, at the expense of the Earl of Wilton. There is also a gas company. The living is a rectory in the diocese of Manchester, value £346. The church, dedicated to St. Mary, is an ancient edifice, with a low square tower. It has an E. window in the chapel, which was restored in 1846, when a N. transept was added. There is also the district church of St. Thomas, the living of which is a perpetual curacy, value £150. This church was erected in 1819 at an expense of £6,000, defrayed by the Dowager Marchioness of Westminster. The parochial charities produce about £9 per annum. There are a National school and a Wesleyan day school, also a Sunday-school. The Independents, Wesleyans, and Primitive Methodists have each, a place of worship. Bishop Kilbye, one of the translators of the Bible, was born in this parish. There are ruins of Radcliffe Tower. The Earl of Wilton is lord of the manor. Fairs for horses and cattle are held on the 29th and 30th of April, and on the 28th and 29th of September for wool, cloth, and pedlary. Races take place about the middle of August." "STARLING, a village in the parishes of Bury and Radcliffe, county Lancaster, near Bury." 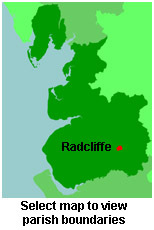 You can see the administrative areas in which Radcliffe has been placed at times in the past. Select one to see a link to a map of that particular area. A description of Radcliffe in the 19th century. View maps of Radcliffe and places within its boundaries. For probate purposes prior to 1858, Radcliffe was in the Archdeaconry of Chester, in the Diocese of Chester. The original Lancashire wills for the Archdeaconry of Chester are held at the Lancashire Record Office.